TYSA opposes the legalization of recreational marijuana due to its negative effects on the developing brain and its ability to hinder motivation and academic achievement among youth. In other localities that have legalized marijuana such as Colorado, Oregon, Alaska, and Washington D.C.- reported marijuana use in the past month has increased among youth aged 12-17. 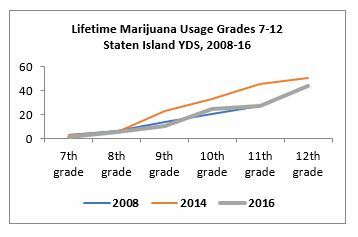 On Staten Island, we’ve seen increases in marijuana use among our middle and high school aged students. Increased use among youth is troubling due to the impact it has on brain development. In a recent study published by the American Journal of Psychiatry*, researchers observed lasting effects of adolescent marijuana use on important cognitive functions that appear to be more pronounced than those observed for alcohol. Increased use has also resulted in an uptick in admissions to treatment programs and an observed increase in hospitalizations among youth who are vaping marijuana wax which has higher levels of THC. Youth marijuana use has also impacted our local education system, where schools are struggling to find ways to address the influx of students attending class under the influence. Research shows that perception of harms and consequences is a driving factor in whether youth will use substances. The legalization of recreational marijuana further erodes the perception of harms and consequences for both youth and adults. The percent of adults that believe that marijuana use among youth is acceptable has increased since 2012. If trusted adults in the community are sending the message that youth use is okay and young people do not perceive marijuana as dangerous, consumption rates will go up. Young people deserve to reach their full potential. The longer we can delay initiation and regular use, the less likely that a dependence or addiction will develop. NYS must take lessons learned from the alcohol and tobacco industries, which pose a tremendous burden to the public health system and have a long history of targeting youth as the next generation of consumers. Establish guidelines in retailer density especially in lower socio-economic neighborhoods. Local communities are often the most successful at surfacing issues and developing targeted strategies and policies and therefore should have the ability to have a say in how marijuana is priced and regulated, unlike alcohol, which is regulated at the state level. We should look for lessons learned from other states that have embarked on marijuana regulation on how to effectively and appropriately manage a substance that has documented negative outcomes on youth. The more proactive we can be in regulating markets such as marijuana, alcohol and tobacco, the better the odds our youth have of getting through their formative years without developing a dependence on substances. * Morin, J. F. G., Afzali, M. H., Bourque, J., Stewart, S. H., Séguin, J. R., O’Leary-Barrett, M., & Conrod, P. J. (2018). A Population-Based Analysis of the Relationship Between Substance Use and Adolescent Cognitive Development. American Journal of Psychiatry, appi-ajp.